Rocksbox is a monthly subscription service for jewelry! You pay $19 a month and each month are sent 3 designer jewelry pieces on loan based on what you request and your style profile. The average worth of your set will be around $200. You then can purchase any pieces from your set that you fall in love with at an awesome discounted price, and you get $10 in “shine spend” each month that you can apply towards any purchases. Rocksbox makes sending back the pieces super easy with a prepaid label and shipping bag included so all you have to do is put it in the mailbox! See why I’m so excited? I loved everything I pulled out of my box this month. But come on, I was most excited about the Kendra Scott earrings. 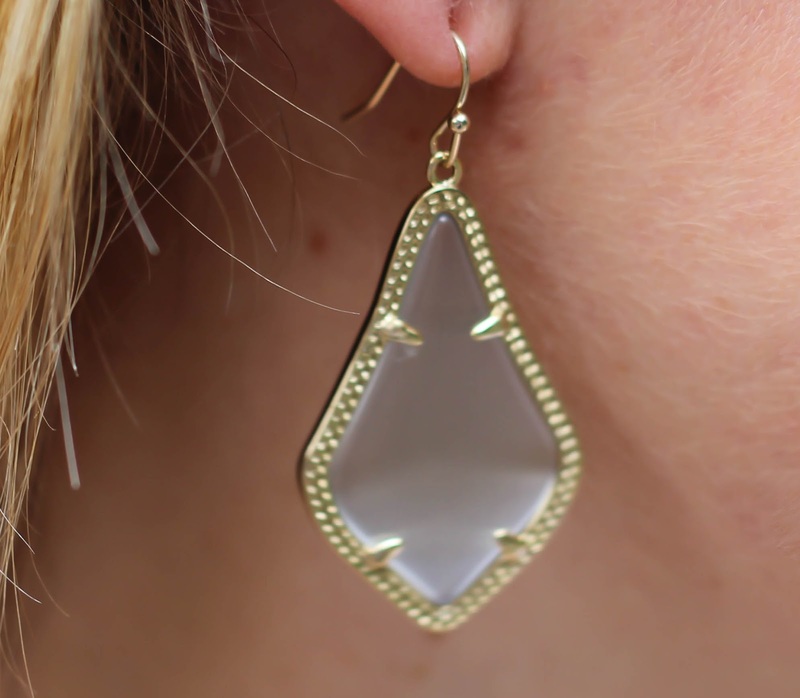 I requested a pair of Kendra Scott earrings from my stylist, and had several on my wishlist, but still didn’t think I would actually get sent some and was thrilled that I did! I love how these dangle, the gold accents, how they’re a neutral color (although I think I would prefer a color that pops a little more). These are not the ones I would have picked out for myself at the store but that’s what I love about Rocksbox. Plus they retail for $55 but have a shine insider’s price of only $44. If I apply the $10 monthly shine spend Rocksbox subscribers get they are only $34 which is a steal! 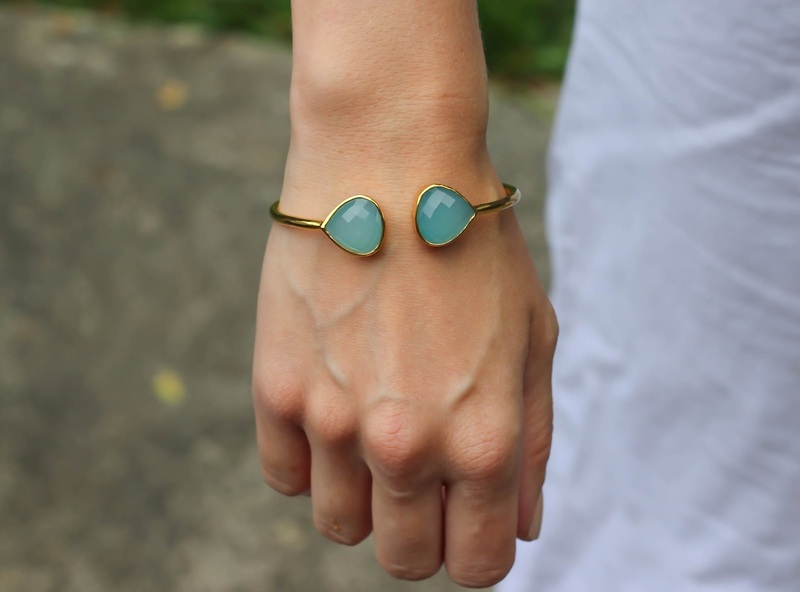 My second favorite piece right out of the box was this Margaret Elizabeth Teardrop Bangle in Aqua Chalcedony. This piece retails for $80 and has a shine insider price of $70. That makes it more expensive than I would typically spend on a bracelet but it’s gorgeous and definitely fashion forward. Only problem is it’s a bit too big for me which was so disappointing! I’m going to be sure to let my stylist know that I have tiny wrists so we don’t have this issue in the future. Last but not least is the Perry Street Olivia Necklace. It retails for $75 and has a shine insider’s price of $60, so it would be $50 after applying my shine spend, which is once again more than I typically spend on jewelry. This too is not a piece I would have picked by myself but I love it! It’s so versatile and easy to wear, and adds some fun bling to any outfit. Definitely a contender for keeping, but the price has me hesitant. Since you get a free month of Rocksbox with the promo code “cervinoxoxo” you really might as well try it out and let me know what you think when you do! But now I need your help – what should I keep? 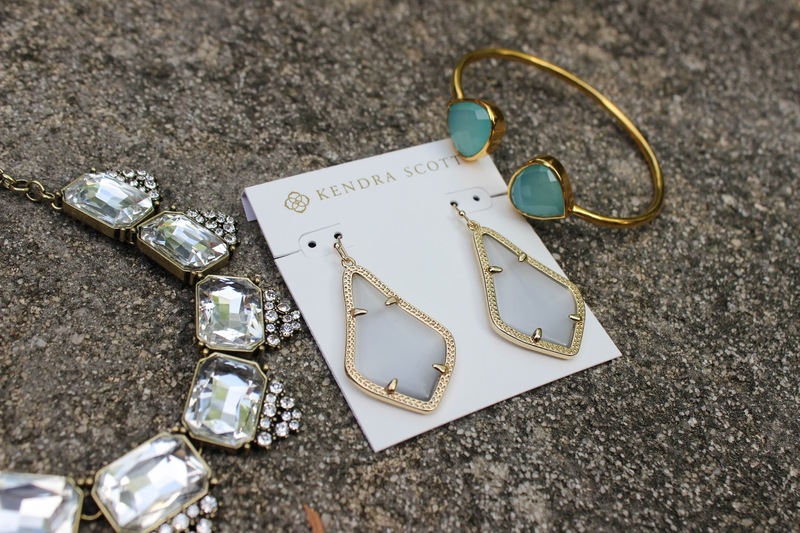 Beautiful pieces…Love the teal! Never heard of rockbox, I will check it out! Thanks for sharing! I love rocksbox! It is so much fun getting new jewels every few months. wow these are gorgeous. I don't know what Rocksbox is. I've never heard of it. You should def check it out! I'm in love with the bracelet! I don't know if I'm fancy enough for a jewelry box rental subscription, but I'm so filing this away as a gift for some impossible-to-buy-for people in my life. Me too! I wish it was smaller 🙁 I didn't think I was fancy enough either but I love it! It would make a great gift too! Pretty! I freaking LOVE Rocksbox. I haven't sent back my most recent box yet because I've adored the set of jewelry I got. I love how my stylist always listens to what I want but still gives me a piece that is a little outside my comfort zone; and I end up loving it EVERY time! I know I had a hard time sending back my last box too! I have been loving my rocksxbox sets! These are some lovely pieces! I love that tear drop bangle. I think it's on my wishlist right now. Hopefully I'll get it in my next box. I absolutely love this service! Especially for trendier pieces that I'd rather not invest a ton in. I love it too! Just wish it was smaller! I love rocksbox soooo much!!! It's such a great concept!!! I've never heard of this before, sounds cool! I'm not much of a jewelry person though, but it seems as though there is a box for everything now! Me too just wish it was smaller! That bracelet is SO beautiful.